Well... here's a couple of instrumental pre-mix sample mp3's just to give you a taste of what the upcoming Flame On EP will sound like. With Christmas upon us, it's time to be honest. The chances of this record we've recorded the drums for ever seeing completion are... well... BIG! I'm making it my personal mission to make get this project wrapped up before we hit 2007. Here's a sound clip that Jeppe and Tobias recorded a long time ago, with a Canon Ixus 400 camera - in glorious mono. Part of the clip is being used in one of the "new" songs we're currently "recording". Check it out if you're a fan of that 11kHz; 8 bit; 88 kbps crunchy sound. We just won promotion from the lowest division so that's pretty cool, and definately newsworthy. Just not on this site I guess. We'll have some Flame On related news soon. So we're all still pretty busy with other things, but we're definately recording the aforementioned songs. We just have to squeeze it in between moving, touring with other bands, becoming a parent and slacking off. We've added the second song from our "Troskot 3 way" session to the mp3 section ( the ofirst one being 'Rage Against The Machine'. We have to face the fact that it will probably never be released as it was intended so here's a little gift to you. Here's Tobias's demo for that same song. More songs to follow. If you can guess where we lifted the design for this poster, drop us a mail at contact@flameon.dk and you'll get a bitchin' prize! We've added some more posters to that gallery as well. We are officially out of business. We have no more shows and the plans to release the new songs as an EP have been dropped for now. Thanks to Alias Caylon for making our last days as a band such great fun! A truly amazing band and just the sweetest guys you'll ever meet. Thanks Fiede, Thays, Fin and Rainer. Jeppe still plays with IOTA and Tobias with The bleeding Archives and any news about Henrik and Charlie's future musical endeavors will be posted right here. Also we plan to make more Flame On mp3s available here soon. Thanks to everyone who made it to Roskilde. Gimle is still by far our favorite venue in DK. The people working there are just THE BEST. Next weekend we'll be rocking Volksbad in Flensburg and Musikcaféen in Aarhus with the amazing Alias Caylon. We have a couple of shows coming up and we're especially looking forward to playing with Alias Caylon (DE) again. Unfortunately they're not playing Copenhagen this time, but everyone in and around Aarhus should really come down and check this amazing band out! After the three shows we have left are done we will be going on a so called "indefinite hiatus" which in lamens terms means that we're calling it quits. For the time being anyway... We're closing up on 10 years in existence and although we have this massive history with Flame On, the descision was quite easy to make. More on this later. Qujanaq Qaqortoq, for denne gang. Soon we will be heading for Greenland. We're all really excited about that, and we're looking forward to meeting everyone and playing two great shows. We're writing some new songs and once we're back from Greenland we will begin laying down some demos for what will eventually become an EP as soon as we're happy with the new songs. We also have a couple of different shows coming up so check the shows section for more info on the where's and when's. 2005!!! Let's all have a great year everybody! LineOut Magazine, Soundvenue, Frantic Sound Magazine, Low Cut Magazine, Waste Of Mind. And the Frantic Sound interview. A photo of Flame On as a four piece here. We're currently writing new songs and we're playing a show friday 10th of dec. at Studenterhuset in Copenhagen. We played Lades this past thursday. Here are some pics. Emil played his final show with us as he is leaving the band to spend more time with his girlfriend. We wish him all the best. Flame On will continue as a four piece for now. Some photos from the DK minitour with Outbreak Here. And some from the show at Imperiet, Herning here. The Show at Paramount DIY in Roskilde on sat. 30.10.04 has been cancelled due to some problems beyond our control. Sorry. We're back from our mini DK tour with Outbreak. Thanks to the people who showed up, the people who took care of us at the venues and last but certainly not least; Outbreak!! We have a few more shows before '05 and then we'll start working on a brand new EP. Flame On Kicked off the 'Overkill' release mini "DK Tour" at Stengade 30 With 6 people on stage! Here's a picture. We've added some new photos and some very old ones as well. Check them out here. Our album 'Overkill' is still pretty hot too though. Overkill is here! We have arrived! It's been a troublesome birth, but our new album is finally here. We like it, and hope you will too. check out the cover art here, or better yet order it here! Here's a new mp3. of the album. The track is called 'Suburban Warfare'. We would like to thank Lasse Malm for helping out on the track 'Dialogue' and Tobias would like to thank Louise B. 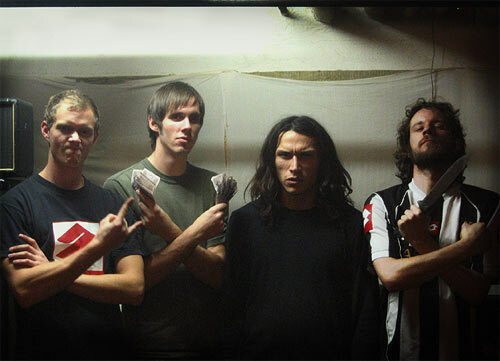 In other news: We've had some questions about the picture of the band which graced our website this past month. It was a mix af two pics. One of Henrik and one of Flame On with Steve standing in for Henrik. Steve is a friend of ours (we're playing at his birthday party soon). If you don't know what all this is about click here. What a summer eh!? Well, that is all going to change on friday the 23rd of July! That's when we'll be heading south to Nykøbing F. to partake in the annual "festuge" celebrations. Please do join us! Nykøbing will be buzzing with activity and you'll be able to catch such diverse acts as; Billy Cross, Power Solo, Je M'Appelle Mads, Kandis and there's even going to be a norwegian black metal band!! Summer is (hopefully) here to stay and we've added some shows for the fall. We may play show or two during the summer, undercover style. Here's some pics from our show with Furillo (RIP) at Klauzdal in Herlev. So we're back from our weekend in Germany. It was a really great trip. Thanks to everyone who made us feel welcome, especially: Dieter and family, all the guys from Matula, AJZ, Alte Penne and the amazing crowd there! New items in the shop. Check it out! Hi all. Flame On will be taking a short break from playing shows (in DK), but we will return with new tracks and whatnot at the end of this year. Thanks! Thanks to the nice people who came and saw us play with Music Mafia at Tex. Some of you are there almost every time and it really means the world to us! Here's a pic of Music Mafia for those of you who missed it. This is the new face of Rock'n'Roll! "Smukke Charlie" is the new bassplayer in Flame On, and Emil is switching to guitar which is what he really wants to do anyway. Charlie may be new in Flame On, but he's an old friend of ours and we welcome him into the Flame On fanily with open arms. He's an extremely talented individual and we're lucky to have him! We're back up - Hooray for us! Minor updates throughout the site and major updates on the way. Just in case you haven't heard it through the grapevine, the show this thursday at Lades (kælder) is a FREE show! We're switching hosting for flameon.dk so the website is down some time during this week. do not despair. It will be back up shortly. Flame On is featured on a couple of compilations coming out in the beginning of the year, and the new album "Overkill" will see the light of day in some form or another. You laugh? "Winter is over - if you want it." Flame On has teamed up with Book King Agency, A new Århus based booking agency run by our friend Thomas Bredahl. Besides Flame On, Book King Agency handles Gobsquad and metalheads, Mevadio. We're looking forward to a productive cooperation with BKA in 2004. In keeping with the holiday spirit, we have a little present for you. It's a song made by Emil and Ditte with a little help from Kimer. If you don't know (or care) who these people are, just listen to this higly up-to-date, bouncy, Clash-esqe track called "Bushosaurus Rex" here. Hello All. We'll be playing our last show for a while tomorrow. Then we'll write new stuff and put out our new cd "Overkill"
We have also recorded 2 new songs. "16" and "Rage against the Machine" yeah we're really clever, we know - just listen to the song and it will make sense. Listen to them here. We recorded both songs in 1 day in our rehersal room. They're being released on a 3 way split on Troskot Records along with two songs form "Overkill" and a live-track. When the split is released we'll probably take the songs off our site, so be quick or be dead! The song 16 was initially recorded by Tobias alone. He played all instruments and sang as well. liten to it here. We won't be playing in Cph. for a while now, as we'll be trying to finish building our studio, write some new material and release our album "Overkill". We will however play shows in Roskilde and Maribo before our little break. Next show is at Gimle with the almighty Furillo - hope to see you all there. We have added a lot of shows to the showlist. It´s great getting to play so much these days. Hope to see you there. Ok so we've played a couple of shows - without telling anyone. Sorry. But hey - we're playing again soon. Check the showlist. The next show is FREE!!! so be there or be a chair!! We have updated some different parts of the site. For instance you can see pics from the night we finished this very website here or listen to some new mp3´s here. We have also added a show on the showlist. This time we are lucky to be playing with (old) friends from Lolland Falster. Welcome to the new + improved Flame On website. Skåååååååål!!! We're all pretty sure this is a good thing. enjoy + skåååål!!!! Ok, so we haven't updated for a while, but we've been working on a new website and we're still recording. In the process we've realized that maybe we're not all that hot when it comes to programming and code and all that jazz. Phew! The world is ever changing and so too is the fate of Flame On. Another lineup-change has been forced upon us. Kimer left and we're trying the big switcheroo. Tobias's younger brother Jeppe (who also drums for Meantime ) will take over on drums. Henrik will be singing and playing guitar. Emil & Tobias will continue on their instruments respectively. We're playing a show at "Studenterhuset" with Sommerset from New Zealand. Please come and make them feel right at home in Copenhagen. Also you'll get a chance to see what Henrik actually looks like without a drumset in front of him. Rock! 2003!! And some news too: We're playing a show on the 25. at Operaen. It will be a kind of benefit show for Chakawoo, so come and show them the support they deserve. Things are looking up for Flame On. We're recording again. This time it's guitars, bass and vocals. We might even get a record out of all this at some point (sarcasm). And tonight we're going to see a great rock show! We've actually played 2 shows without telling anyone. One show in Viborg with Gobsquad and one in Roskilde with Furillo. The show at Gimle in Roskilde was broadcasted live on DampRadio and we just might put a live Flame On track or two up here on this site. Are you wondering what we've been doing lately? If you are, here's some random pictures. If you are not, here's some pictures anyway. We haven't been recording a whole lot lately that's for sure, and that's too bad. Flame On would like to thank Charlie, the bands, and everyone else who showed up at Charlie's 25th birthday party last saturday. We're playing 2 shows on the 13th and 14th of sept. At Elværket in Helsingør on the 13th and at a private party in "Dragens Hule" on the 14th. It's our friend Charlie's birthday party. Entrance is only 20 Kr. We've been busy recording, harvesting, getting our hearts broken and teaching Emil ( the new bassplayer ) the tracks. We might play a show soon (01.09.02@Stengade 30). If we do, it will be with John on the bass. Flame On are featured on the "Don't Let The Mixtape Die! Vol. 1" tape compilation. The tracks is "Endsville Horror"
Other Bands include: MDC, Hail Mary, Sand Witch Is, The Get Up & Go'ers, Roswell and 25 other bands from around the globe. With the release of the new cd, we'll also launch a new (and hopefully improved) website. We're releasing the record ourselves unless someone steps in and lends us a helping hand (wallet). John is leaving for Viborg! We have known this would happen for a while now and now you do too. John is leaving to attend a school in Jutland to become an animator. We, nor he knows excactly when or if he's coming back, so the show sat. 22.06.02 at Krunch might very well be his last with Flame On. All is, however, not lost for Flame On. We're still doing the record and we'll have some news on John's replacement, however permanent it may be, here soon. Flame On will be playing this saturday (22.06.02) at Krunch with Chakawoo. When playing this saturday (08.06.02) at Gimle in Roskilde, It will be exactly 6 years since we played our first concert. Just a little bit of useless Flame On info. We finally played in Nyk. F. which was fun. Flame On have a song on a Bulgarian punk comp. The show in Nyk. F. WILL take place on 17.05.02 at Kulturfabrikken. There's been some problems regarding our gig at Kulturfabrikken and it seems we're forced to reschedule. Fri. 17. May is an option, but check back soon if you want to be certain. If you live in Nyk. F. please tell your rock-lovin' friends, as we know only to well that Kulturfabrikken's rockshows are not to well visited. Thanks. Thanks to Gob Squad for playing with us at Loppen, and to all the people who came out (naked as well as drunk!). Flame On returns to the scene of the crime. To where it all began. Nykøbing F! - We're playing with Gob Squad on sat. 11.05.02 at Kulturfabrikken. Flame On will be playing at Loppen with Gob Squad on friday 05.04.02..
for a more in-depth update. A brand new year is upon us and Flame On started out by playing a show in "Ungdomshuset" with 3/4 of the band being more or less sick with the flu. Rock'n'Roll!! A lot of people turned up though. Here is a few pictures of how that all went down. Futhermore we have had our one year old demo reviewed in the free music magazine Gaffa. Another show has been added. We are playing with The Movement at Ungdomshuset, Jagtvej 69. It looks like a couple of shows might be added in the near future. Check back soon for an update!